The cloud and virtualization are forcing a paradigm shift from machine centric to user centric computing. 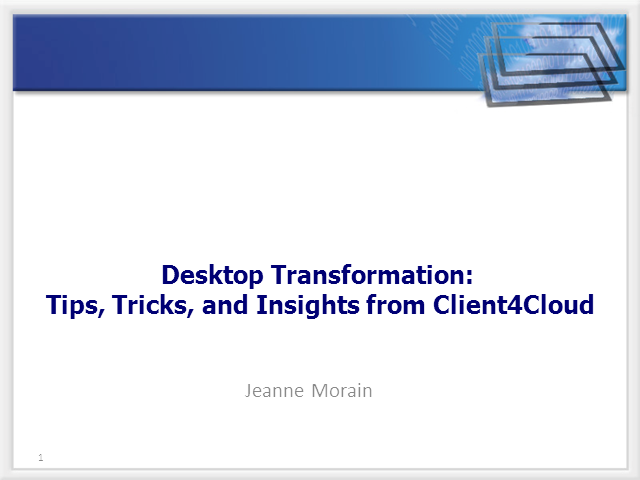 Join Jeanne Morain as she provides insights from her latest book - Client4Cloud: Desktop Transformation to Dynamic Universal Clients. She will share key findings from industry experts (Microsoft, Citrix, VMware, Analysts) on client virtualization and their customers on the challenges, lessons learned, changes, and prescriptive guidance for successfully making the transition from machine centric to user centric computing.